There aren’t that many documentaries that don’t feel like documentaries. I really didn’t know “Fire at Sea” was a documentary until about a third of the way into it. There is no narration and very little statistics appear on-screen in Italian director Giangranco Rosi’s latest documentary, which is concerned more with observing and following the people who live or arrive on the island of Lampudesa, than it is telling you information or taking a particular stance. It is a film that shows instead of tells. When his previous film “Sacro GPA” was released two years ago, Rosi referred to his style as a ‘lived-in approach’ and certainly that is what is apparent here. By doing so, he humanizes his subjects, capturing their lives up close and providing an immersive viewing experience that draws his audience closer and closer to the screen. 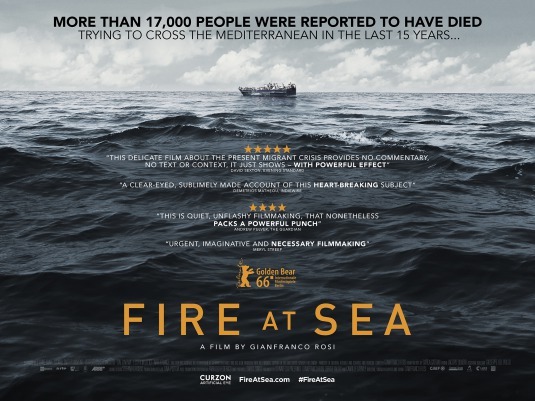 Humanizing the people we watch in “Fire at Sea” is an important decision because most of them are African migrants from nearby Tunisia as well as Libya and Nigeria, many of them escaping rebellions. Since the film doesn’t go into any details – again, it thankfully shows instead of tells – I was compelled to do a little research of my own on the film. Lampedusa is the largest and southwestern most of the Pelagie Islands in the Mediterranean Sea. In recent years, it has become a sought after entry point into Europe for unauthorized foreign national migrants from the Middle East and Africa. Rosi doesn’t introduce his audience to migrants right away. At first, all we do is hear their distress calls over the radio with the writer/director, who also serves as cinematographer (for the first time, he used an ARRI Amira camera, allowing him to shoot in dark environments), fixating on a rotating Coast Guard antenna and a control room, as a distressed woman can be heard, “Please, we beg you.” She and the others with her are in peril. Indeed, her boat is sinking, like so many do, but she can’t provide her location. 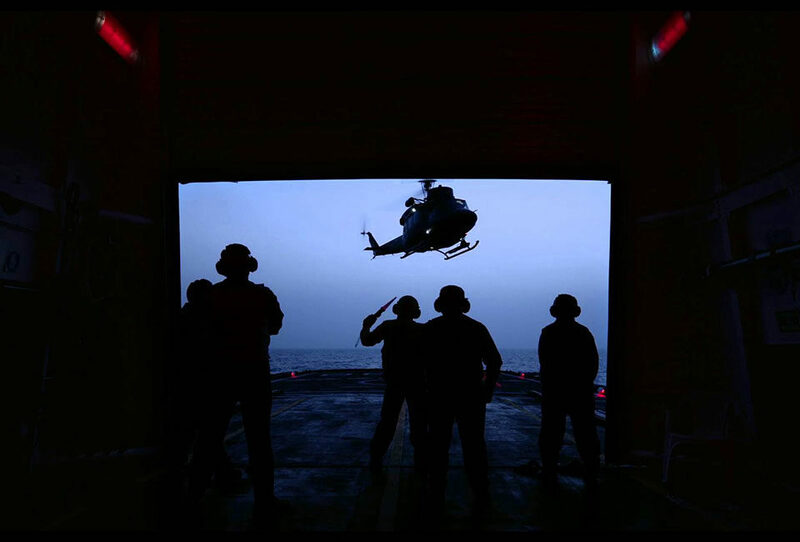 All that is seen is a deck of a boat as a searchlight cuts across the waves at night. The radio waves later report that another boat has sunk and two hundred-fifty are dead. This can be heard while a grandmother is cooking in the kitchen. She acknowledges the news, “those poor souls” and continues with her morning. 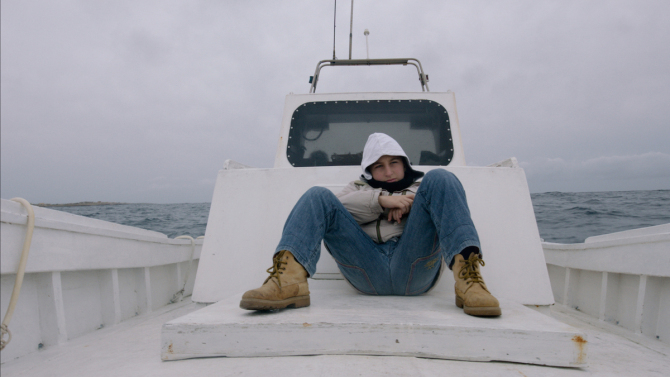 Throughout the film, attention is given to certain islanders and their families as well, many of whom rely on fishing for work and food, and we wind up following their lives as closely as the migrants who’ve recently arrived. We go back and forth – from a lazy-eyed, 12-year-old-boy and his slingshot who lives with his fisherman father and grandparents to the studio of a local DJ who plays requests for locals – all with a focus of bringing to light life on the island. The camera travels with a boy, Samuele Pucillo, as he wanders around cactus bushes with his friend and climbs a tree in search of just the right branch for a slingshot. We sit with him as he is educated, receiving lessons in the classroom and in the harbor as he learns how to row a boat. 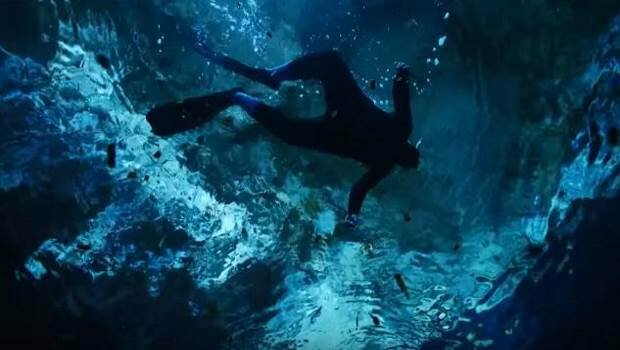 There’s also a loan diver seen, a man who explores the ocean floor near the island, during the day and at night, searching for who knows what. As much as “Fire at Sea” is about the thousands of migrants who seek refuge on Lampedusa (while only focusing on a few), it’s also fascinated by the life of the indigenous people of the island. There is a doctor on the island who Rosi checks in with also. He is silhouetted by the glow of an ultra sound, telling the African woman laying on the table next to him that a cultural mediator will be on his way, so they can communicate better, as he tries to tell the refugee the gender of the twins in her belly. The precocious Samuele also has a conversation with his optometrist, who prescribes an eye patch for him to wear to help with his lazy eye and with his pediatrician, who patiently listens to the boy describing his sporadic breathing pains. There is something hypnotic about these moments with medical providers. I found myself surprised at how enamored I was by these conversations, as both doctor and patient are so focused and expressive with each other. About an hour into “Fire at Sea”, Rosi focuses on a trio of Africans, where one Nigerian man sings a testimony in a cramped place, recounting the story of their perilous journey, of the volatile environment they fled and the lives lost along the way. They are heroic for fighting for a better life and deciding to rise above the cruel fate they were destined to in their own land due to dictatorships and ISIS. It’s a transfixing lament that shows what a conscientious filmmaker Rosi is. He is determined to give everyone he can a voice. But the most memorable moment is when Rosi lets the camera role on the empathetic doctor, who can be seen viewing pictures on his computer and shuffling papers on his desk. Framed in a profile, the doctor recounts how overcrowded these boats are, at times they can be 850 migrants on the double-tiered boat, who had paid somewhere between $850 and $1500 to be in such confined conditions for at least a week. He reflects how he sees hundreds of them for exhaustion, dehydration and malnourished conditions, rejoicing when he can save a life and is saddened when he inevitably cannot. In a poignant reflection, the doctor pauses and shares, “It’s the duty of every human being to help these people”. He admits, when he saves lives, he rejoices, but when he cannot and patients die, he is “forced to do the thing I hate the most…examining cadavers.” Although he’s seen hundreds of dead migrant bodies (that wind up in bags and coffins), he can never get used to it. It haunts him and gives him nightmares. In “Fire at Sea”, Rosi does two things very well, establishing a sense of place while presenting a group of people who are in need of a place. It is artful and conscientious filmmaking that captures the lives in and around an island, simply to say these lives exist alongside each other, mostly without any of them knowing of each other, except to announce their demise on the radio. The film premiered earlier this year at the 66th Berlin International Film Festival, where it won the Golden Bear award. It’s been making its way along the festival circuit since then, stopping at Telluride, New York and the Chicago International Film Festival. 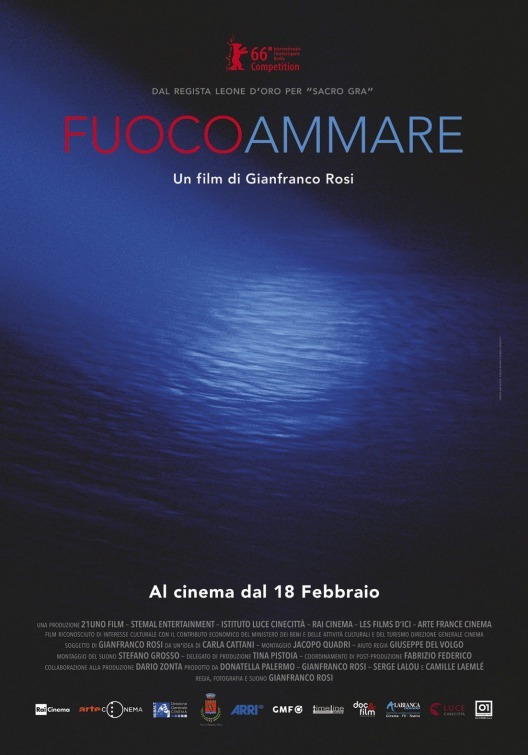 It was selected as the Italian entry for the Best Foreign Language Film at the 89th Academy Awards.